A couple of evenings ago Ms Connection and I wanted to collapse onto the couch for a bit of screen time togetherness. As it was a week-night and we’ve found that anything too exciting disrupts fragile sleep patterns, it was agreed that something gentle and preferably funny was the order of the night. 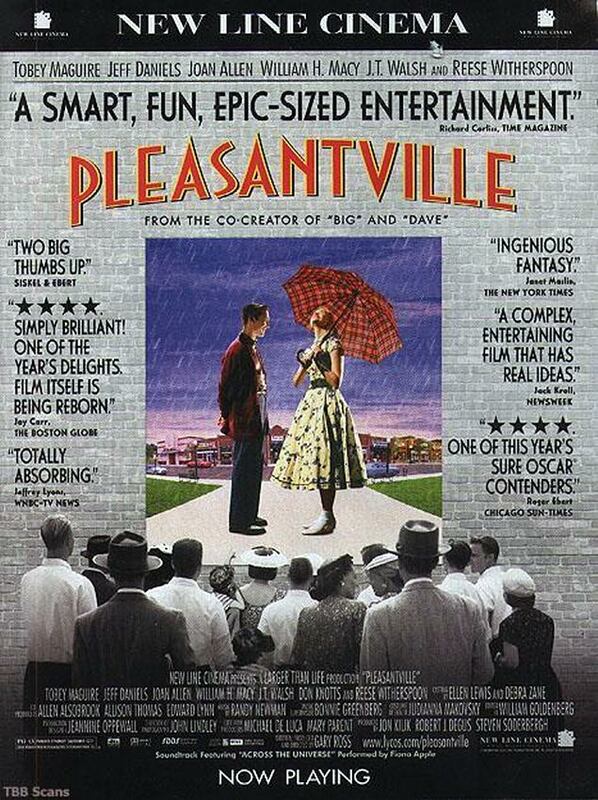 So I dusted off a copy of Gary Ross’s 1998 comedy, Pleasantville. It was a film we’d watched together soon after its release so we also got the added warmth which flows from a film you already know and like. But rain has washed a lot of debris into the stream of consciousness. It may still wind its way towards Lover’s Lane lake, but the memory current is rather more sluggish. So although we both remembered the basic premise of the movie – shy teen and his rebellious gum-chewing sister get catapulted back into a monochrome apple-pie US sitcom set in 1959 – there was much to re-enjoy in the re-screening. But there is a cost to this safe, repetitive perfection. Either in the limited vision of a two-street town with a library full of blank-paged books or the soul deadening effects of endless repetition. Safe but not really alive. That’s where the change begins. New ideas come from the sassy assertiveness of Reese Witherspoon’s feisty teen. And colour – eye-widening, sensual, terrifying colour – starts to appear. The teenagers are, naturally enough, the group most open to the possibilities of a wider horizon. The film cleverly encapsulates this theme in the yearnings of the diner-owner, a boy-man who grills the cheeseburgers but yearns… to paint. When Tobey Maguire’s “Bud” brings him a book of Art, things start to really get vivid. In that iconic American way, the young folk gather at Mr Johnson’s diner where they sip cherry-cola and listen to the jukebox. There’s a wonderful moment when Dave Brubeck’s “Take Five” starts playing. It’s almost a shock to hear those vamping piano chords splashing out of the Seeburg M100C coin-in-the-slot record machine (as seen on Happy Days, folks!). “Take Five” was massive in 1959. The first million-selling jazz instrumental single ever to hit the Billboard Hot 100. Despite it’s unprecedented 5/4 rhythm, alto saxophonist Paul Desmond’s tune has a simple, inviting melody with a gently off-kilter groove that ensured its popularity then and now. The use of jazz in the film was a deft move. The Brubeck Quartet’s Time Out was a jazz album even suburban white folks could enjoy, the innovations of his integrated band somehow infiltrating the conservative headspace of middle America. From the opening piece – the eastern influenced, blues infused “Blue Rondo a la Turk” – in a 9/8 time signature, this exultant album deserves its high regard. And maybe, from this beginning, some listeners found the courage to investigate other landmark jazz albums that appeared that very same year. When the sticker on my 2009 re-issue of Time Out proclaims “1959 – Jazz’s Greatest Year” it is by no means an outrageous claim. The Bill Evans is one of my favourite jazz piano albums, a record of exquisite delicacy and under-stated melodic depth. 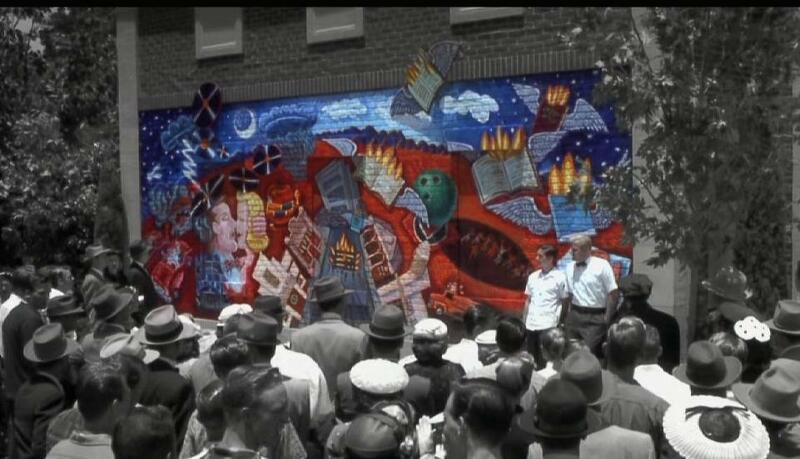 Kind of Blue needs no further introduction other than to note that “So What” also appears in Pleasantville. The others might stretch a listener unfamiliar with jazz, but will repay the investment richly. Aficionados will naturally have their favourites or indeed other albums that ring their ’59 bells, but I have an enduring man-crush on Mingus Ah Um. It’s cocky, it’s passionate. It rolls and sashays, pouts and sanctifies. It is a technicolour jazz album whose cover art by S. Neil Fujita shouts, “I’m alive, I’m different, I’m modern!”. There is danger and darkness in venturing outside the fields we know, whether it’s the Pleasantville town limits or our accustomed listening room. Writer/Director Ross reminds us of this when the stain of sexual violence seeps into monochrome males as their predatory gaze threatens fresh, vivid women. It ain’t all pink blossoms and snogging at Lover’s Lane. Meanwhile, the conservative townsfolk gather at the Town Hall to legislate life out of the town with a proclamation of censorship. Coloured oil paint will be banned, music choice restricted to Matt Monroe and Perry Como. The kids play Buddy Holly’s “Rave on” on the jukebox. The climactic scene occurs in the Town Hall in a brilliant echo of the To Kill A Mocking Bird court scene with the ‘coloreds’ confined in the upper balcony while the power-holding (black and) white men run the show on the floor. Conformity trades off creativity for safety. Dave Brubeck’s record company did not want to release Time Out, deeming it too out there, too radical. But listeners voted with their ears (and wallets). As humans we crave security. But we need stimulation and novelty too or it all becomes tediously monochrome. Dip into some jazz. Git some colour in your soul. Far be it for me to force feed anyone on music (cough cough) but if you find yourself feeling a little peckish, come over all esurient like, notice an unfamiliar pull towards an exotic dish… the two morsels embedded in the post are definitely worth a nibble. That’s the sound of the guru backing off so fast he trips over his threadbare robe. ‘Better git’ tedious? You win. I’m gone. No more proselytising for the Church of Jazz. Meet ya down the pub for a pint? Blues & Roots (Mingus) might jjjuuusssttt be bearable, Marie. A great film with some amazing performances by Jeff Daniels, Joan Allen, JT Walsh, and William H. Macy; not to mention Tobey and Reese. A movie that at first glance could seem a little light, silly, and even pedestrian, but take a closer look and there’s so much more there. Being someone that grew up in the Midwest loving old reruns of Leave It To Beaver, Ozzie and Harriet, and even Father Knows Best I could relate to the Maguire character. Getting lost in these worlds and time frames where the biggest problem was getting the yard raked before Dad got home, or saving paper route money so a mail-order sling shot could be bought, was rather appealing to a kid like me. Excellent post. I may have to spin Time Out now. Nice summary J. Glad to have evoked some memories of various kinds. The wife and I saw this in the theater back in simpler times, aka before children. We’d go see a movie every weekend pretty much. Another great thing I remember about Pleasantville was Fiona Apple’s cover of “Across The Universe”. Thought she did a nice job with it. Yes she did. Recently picked up a CD of Ms A – Ms Connection has had it on high rotation in her car. 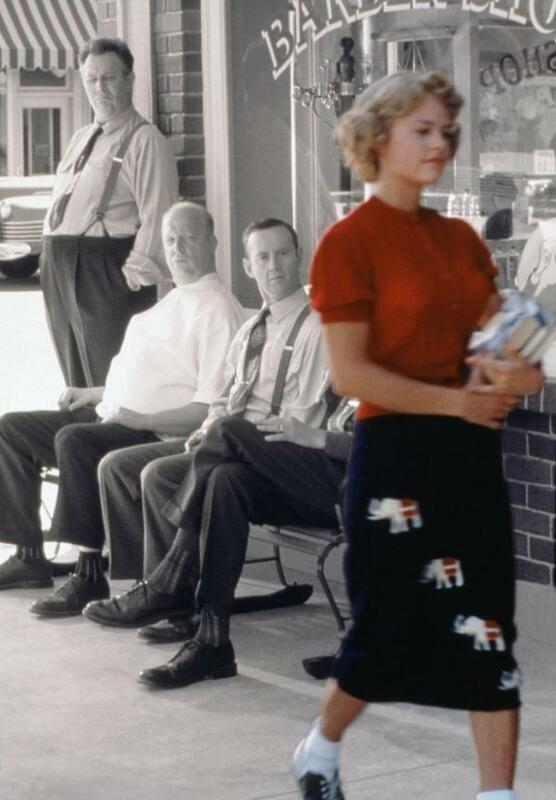 Ah, Pleasantville – I lived there once. (I haven’t seen the film but will see if I can get it). I think you’d really like it DD. Do you have a favourite album from “Jazz’s Greatest Year”? It’s hard for me to go past ‘Kind of Blue’ as the favourite from 1959. But I love Mingus, and Brubeck’s Time Out has been with me since the beginning of time. (Some of us are descended from Cro-Magnon, others Cro-Mingus). Really enjoyable film, really enjoyable music, really enjoyable piece. I always think Brubeck doesn’t get the kudos he should do, leading a mixed race band in those days was a courageous thing to do. Yes, Brubeck was often damned with faint praise or devalued because of the undemanding melodiousness of Desmond’s sax parts. Although Benny Goodman had played with Teddy Wilson in the late 30s, integrated small groups were not at all common even twenty years later. That year (1959) was when Miles invited Bill Evans to play on Kind of Blue. Thank goodness all that racial bias stuff has been sorted out across the world now. Ha, yes its good that we can finally bring our children up in a world devoid of division and bigotry! On a broadly similar musical vein I’ve got a bit of a thing for Erroll Garner’s ‘Concert By The Sea’. It makes me feel a bit sophisticated owning it. Wonderful, Bruce! The film is marvelous mix of the time and of breaking rules, especially with its needle-dropped jazz pieces that make for a simply splendid soundtrack. So glad you sent me the link to this post, my friend. Awesome. Thanks a lot Michael. I loved writing this even though I knew my usual music-audience might find it a stretch! Lovely to have a response from a film nut!! Popped in here to check out your take on Dave and I’m going away with a flick to watch. Good list on the jazz records. I dig all those choices. I love Dave’s sound. CB doesn’t dig for a lot of info on people but knows enough about DB to say he was a pretty special human being. Proof you can be a nice guy and play really cool music. Another good one Bruce. Will check out the flick for sure. JT Walsh and Macy are always in good stuff.